Discussion in 'The Beautiful Game' started by comme, Nov 19, 2009. Just, to saying that Julinho played at WC 1954, where he was the best winger in the tournament. How do we know Julinho was better than a Rahn or Czibor? Who has said that? 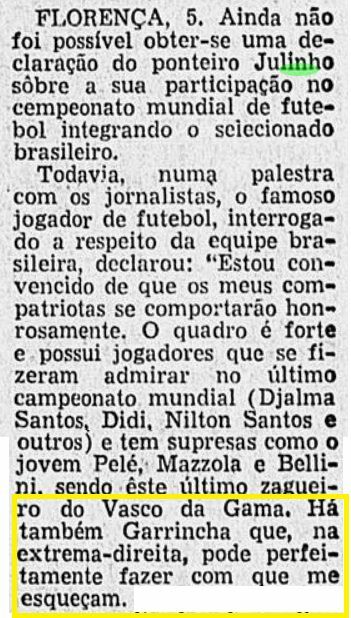 Julinho played against Mexico (which was a rout), Yugoslavia (a match that often gets assigned to Didi) and then lost with his team against Hungary. He scored a goal against Hungary, that is true, but it was also a game infamously ruined by muddy rain and violence. Hard for any player to really show your true worth. The top rankings of players of Alfredo Di Stefano in mid 1979. It's interesting that he scored Charlton with 10 points and Cruyff with 8 being 1979 (with the career of the Dutchman fresh in the analysis). Surely you can't take mainstream rankings at face value. I find the likes of Erico and Figueroa ranked quite highly in the better researched lists. However, while it is neither ideal nor fair, I do favour players who have had chances to prove themselves than those who haven't. The likes of Erico, Moreno, and Julinho (considered first choice above Garrincha in 1958, but didn't play in World Cup) are classic examples. They didn't get the kind of chances to prove themselves that they would if they were playing today. It is unfortunate, but without those opportunities, it wouldn't feel right to place them above the people who have proven themselves. 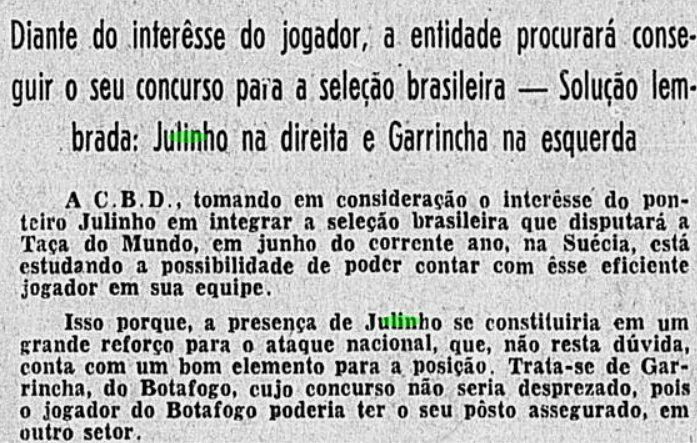 It is not what I have seen, it wasn't the general consensus, for some Garrincha was preferred in the place of Julinho, although they considered that Julinho had more international trajectory than Garrincha. Yeah, the three were in the conversation for best winger. Point is, Julinho has showed his class far beyond a regional view. Which was said about Erico, Moreno, etc. Is Julinhos solo run goal against Hungary in the 54 World Cup recorded anywhere? Elías Figueroa is a very interesting case for me. The more I see him more I think he was a higher level player than the average estimate and a lot of his career that I can't review visually it's usually documented as exceptional, especially in Uruguay. It's difficult to notice the low points in a retrospective review, but even his late career in Chile with a humble Palestino still seems incredible. As well as I consider Scirea or the other South American reference, Passarella, I'm at a point where I don't see how don't rate him over them and to debate about his position compared to Baresi. The only 1970s player with the same or more points is compatriot Mario Kempes, which has no value. Nor do his points fully match with the commentary he makes. Anyway, this are already three sentences too many. It could have been a more interesting discussion. There was no discussion. There was only your listdump. Not to mention how you clearly ignore the various evidence and lists I've posted (example) while happily accepting and repping the things by others, if it is preaching to your choir (including your integral taking over of kicker terminology, very revealing). You clearly had no interest in my recent thread for instance, and when pressed upon you just ignore the observations raised. This are my final words on this. If you want to have the last word, go ahead. The only 1970s player with the same or more points is compatriot Mario Kempes, which has no value. Nor do his points fully match with the commentary he makes. Yes, that also makes it curious, that the comments of the interview don't exactly fit that list by points. Ok, I won't answer extensively this because I think you're too emotional now (and this is not the corresponding thread). I usually like very much your contributions when you're not and we can discuss only about football. I don't really see what is the problem for Figueroa. You only have to look at his English and Spanish wikipedia to see plenty of 'mainstream' lists have honored him (not as high as the IFFHS vote, but okay). His limitation is simply that he was a (true) defender, and in almost all lists there is a limited amount of spots for defenders in a top 100. L'Equipe in 1999 for instance explicitly thought about this, and explicitly spelled out there is only place for ten defenders. I think this might be the case. The cultured defenders have distinct advantages when it comes to all-time rankings, for obvious reasons. I've read many sources that Figueroa was a very cultured defender. Some called him the Beckenbauer of S. America (or Beckenbauer the Figueroa for Europe!). However, from the video footage that I've seen of him, his ball-playing abilities were really nothing special. I rarely see him dribble 20-30 yards or make those beautiful long passes that a Bonucci would. Compared to his contemporaries, I think both Beckenbauer and Krol showed much more accomplished ball-playing abilities. Admittedly, I've seen more footage of these two than I have of Figueroa, including a few full matches. Having said that, I am a recent convert of the church of Elias Figueroa. 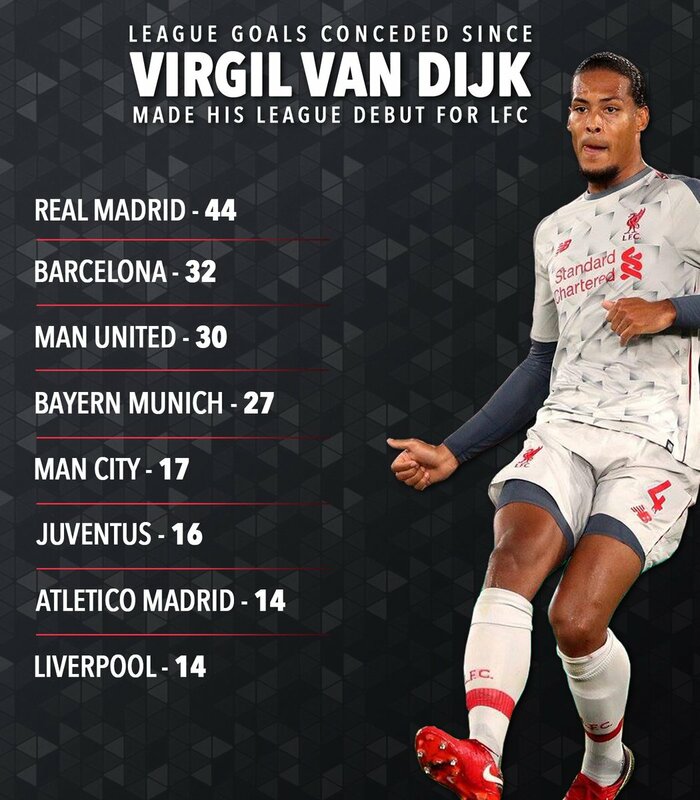 Of the 'true' defenders, as you put it, I've now come to believe he is the GOAT. Can you explain that call with some tangibles? I do find Figueroa his ball skills a lot better as the one of Sammer for instance (and Cannavaro obviously). I watched past week the Portugal vs Germany match of 1996. Very interesting and intruiging view. I mean tangibles of this kind. Without spamming the whole 100, I demoted Laudrup by discounting EC92. I would like to plug in Erico but I am lacking resources of any international exploits of his. In other words, I am trying to detach Arsenio from Sastre as to determine if Erico was a common 8 for effective skill or if he might actually be worthy of the scarse 9. It seems that without Sastre the outlying goals per season dropped. Ideas and other feedback is much appreciated!